Longtime fans of Jethro Tull will recall the above lyrics from the unsavoury tale of a corrupt degenerate named Aqualung. 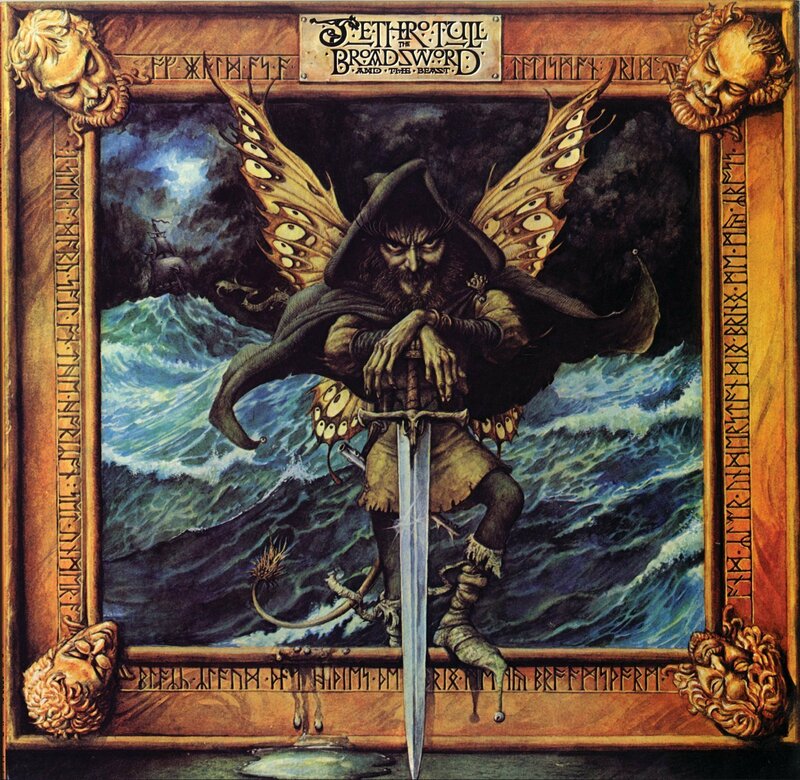 That tune, with its heavy melodic riff, spasmodic drumming, and rolling electric/acoustic lead break, combined with such hits as “Living in the Past” and “Bungle in the Jungle” to make Jethro Tull one of the most successful and highly acclaimed bands of the seventies. From the pastoral eloquence of “Thick As a Brick” to the shuffling madness of “Locomotive Breath”, there was something for nearly everyone on a Tull album. 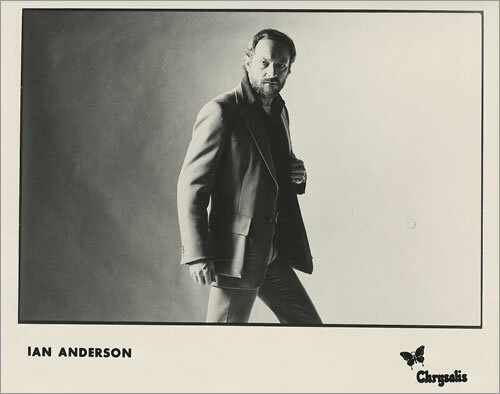 The man most responsible for the band’s distinct sound and biting , succinct social comments was vocalist/flautist Ian Anderson, cheif songwriter and resident madman. With straggly hair and beard, leotards and hunting cap, Anderson came across in concert as a prancing woodsman/elf or modern-day pied piper. 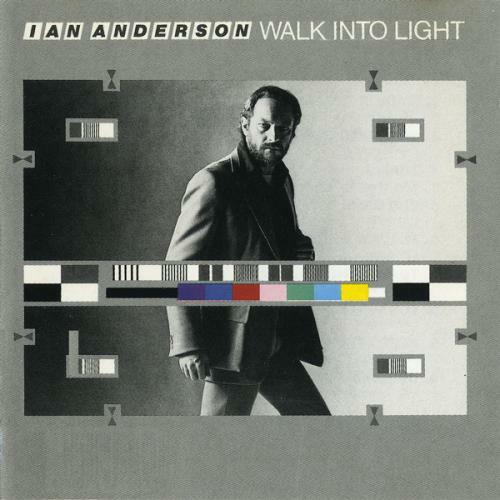 Well the hair and bear have been trimmed, the hat is gone, and on the cover of his first solo album, Walk into Light, Anderson is sportily dressed in leisure suit and matching slacks. And the music has changed too. Computers and synthesizers are the main attraction now. But Anderson’s keen tongue is intact and his quirky, essentially British lyrics still carry their individual stamp and attack. Particulary impressive are the album’s first single, “Fly By Night”, and “Different Germany”. 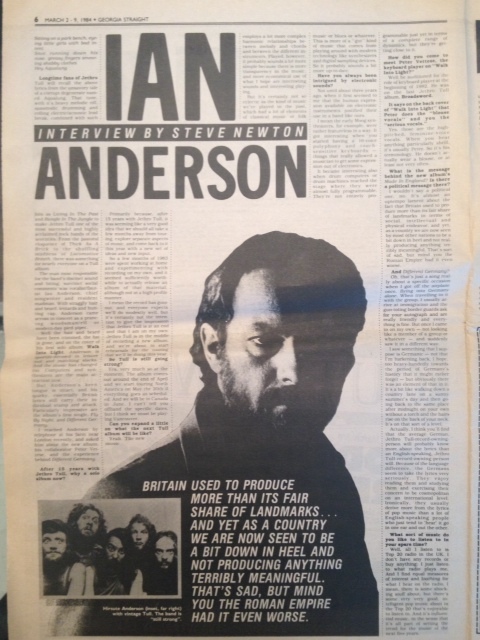 I reached Anderson by telephone at his farm near London recently, and asked him about the new album, his collaborator Peter Vettese, and the experience behind “Different Germany”. After 15 years with Jethro Tull, why a solo album now? Primarily because, after 15 years with Jethro Tull, it was seeming like a very good idea that we should all take a few months away from touring, explore separate aspects of music, and come back to it this year with a new set of ideas and new input. 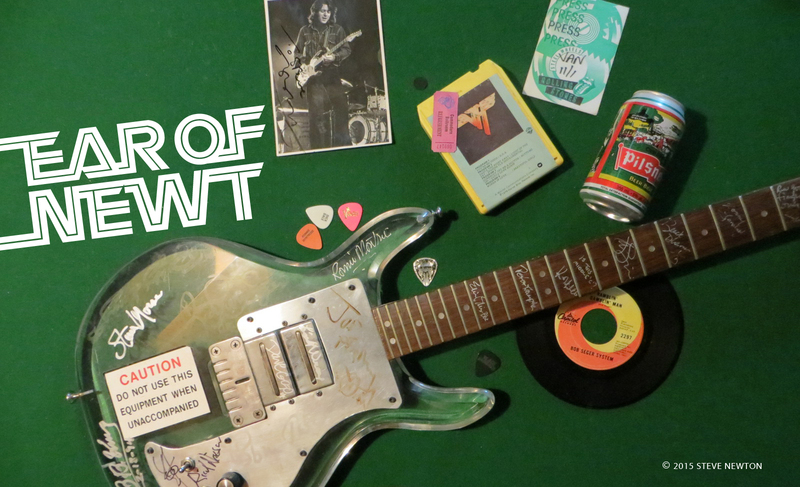 So a few months of 1983 were spent working at home and experimenting with recording on my own, and it seemed sufficiently worthwhile to actually release an album of that material, although not in a high-profile manner. I mean the record has gone out, and everyone expects we’ll do modestly well, but it’s certainly not the intention to give the impression that Jethro Tull is at an end and that I am on my own. Jethro Tull is in the middle of reccording a new album, and we’re about to start rehearsals for the touring that we’ll be doing this year. So Tull is still going strong? Yes, very much so, at the moment. The album comes out around the end of April and we start touring North America on May the 20th if everything goes as scheduled. And we will be in Canada in June. I can’t tell you offhand the specific dates, but I think we must be playing Vancouver. Can you expand a little on what the next Tull album will be like? Yeah. The new music employs a lot more complex harmonic relationships between melody and chords and between the different instruments. Played, however, it probably sounds a lot more simple because there is more transparency in the msuic, and more economical use of what I hope are interesting sounds and interesting playing. But it’s certainly not so eclectic as the kind of music we’ve played in the past, which had a lot of elements of classical music or folk music or blues or whatever. This is more of a “gut” kind of music that comes from playing around with modern technology like synthesizers and digital sampling devices. So it probably sounds a bit more up-to-date. Have you always been intrigued by electronic sounds? Not until about three years ago when it first seemed to me that the human expression available on electronic instruments justified their use in a band like ours. I mean the early Moog synthesizers, for example, were rather featureless in a way. It got interesting when you started having a 16-voice polyphony and touch-sensitive keyboards–things that really allowed a musician to get some expression out of electronics. It became interesting also when drum computers or drum machines reached the stage where they were almost fully programmable. They’re not entirely programmable just yet in terms of a complete range of dynamics but they’re getting close to it. How did you come to meet Peter Vettese, the keyboard player on Walk Into Light? Well he auditioned for the role of keyboard player at the beginning of 1982. He was on the last Jethro Tull album, Broadsword. It says on the back cover of Walk Into Light that Peter does the “blouse vocals” and you the “serious vocals”. Yes, those are the high-pitched, feminine-voice vocals. When you hear anything particularly shrill, it’s usually Peter. So it’s his terminology. He doesn’t actually wear a blouse, or at least not very often. What is the message behind the new album’s “Made in England”? Is there a political message there? I wouldn’t say a political one, no. It’s almost an uptempo lament about the fact that Britain used to produce more than its fair share of landmarks in terms of social, intellectual, and physical endeavour; and yet, as a country we are now seen by most other nations to be a bit down in heel and not really producing anything terribly meaningful. That’s sort of sad, but mind you the Roman Empire had it even worse. Oh, that’s just a song really about a specific occasion when I got off the airplane once, flying into Germany alone. When traveling to it with the group I usually arrive at immigration and the gun-toting border guards ask for your autograph and are really friendly and everything is fine. but once I came in on my own–not looking like a member of a group of whatever–and suddenly saw it in a different way. I saw something that I suppose is Germanic–not that I’m harkening back, I hope, too heavy-handedly towards the period of Germany’s history that it might rather forget–but obviously there was as an element of that in it. It’s a bit like walking down a country lane on a sunny summer’s day and then going back to the same place after midnight on your own without a torch and the hairs rise on the back of your neck. It’s on that sot of a level. Actually, I think you’ll find that the average German, Jethro Tull-record-owning-person will probably know more about the lyrics than an English-speaking, Jethro Tull-record-owning-person will. Because of the language difference, the Germans seem to take the lyrics very seriously. They enjoy reading them and studying them and exercising their concern to be cosmopolitan on an international level. Ironically, they usually derive more from the lyrics of pop music than a lot of English-speaking people who just tend to “hear” it go in one ear and out the other. What sort of music do you like to listen to in your spare time? Well, all I listen to is Top 20 radio in the UK. I don’t have any records or buy anything; I just listen to what radio plays me. And I find equal measures of interesting and loathing for what I hear on the radio. I mean, there is some shocking stuff about, but there’s some very very good, intelligent pop music about in the Top 20 that’s enjoyable to listen to. And it’s influential music, in the sense that it’s all part of setting the trend for the music for the next five years.